We watched the news with our mouths open. Throughout the entire world literary sighting were happening. Dracula was strolling around in London and there had been eyewitness accounts of a great white whale in the Pacific Ocean. The world was in utter chaos and no one knew what was going on. We had barricaded our house because a bunch of oompa loompa’s tried to get in. Outside we heard screaming and laughter coming from humans and creatures alike. ‘We need to help these people somehow.’ I said. ‘We can’t let them in here. It’s too dangerous, we can’t tell if they’re fiction or non. If you let a little girl in here, she could turn out to be a monster. I‘m not willing to take that risk.’ Guy walked away from the TV, frustrated and talking to himself. ‘But where are we supposed to get a lion?’ I asked. ‘Fiction is bleeding into reality. I think we can do whatever we want.’ Poe’s eyes flickered with a hint of excitement. The cigarette was at last inserted into the hole. The cigarette was lit. For a while the bed itself appeared to be smoking the cigarette in great heaving drags. It coughed long, loud and shudderingly and then began at last to breathe in a more measured rhythm. In this way, Dirk Gently achieved consciousness. I opened a random door and found myself in the dump Dirk called his bedroom. Poe had joined me in the doorway and Dirk looked at us angry and confused. Dirk looked more tired than last time we saw him. He looked worried, burdened. He continued his lament. ‘It’s just so terrible when you already know what people are going to say. Life becomes so slow and meaningless. I don’t think I feel like helping you. To be honest, I just want to lie in bed all day and smoke. It’s just all so tedious. ‘Do you think so?’ I whispered to Poe. ‘We need to say something to convince him. Look at him.’ He replied softly. I nodded at Poe and then tried to look earnest at Dirk. ‘Well, your house was completely destroyed. The rest of the book was just silent, it looked like a ghost town. I couldn’t find a single person. I think the Writingdesk Conundrum had something to do with it.’ Poe shuddered almost invisibly. I could only imagine what he had seen. ‘I think we can manage that.’ Poe said. It took a bit of effort, but in the end Poe and I were able to transport Dirk to the real world. I rolled my eyes and Poe had to hide his laughter in a cough. We had landed a bit away from the front door. Our lawn was still filled with people, but no one had noticed us, they were all too busy with their fiction friends and foes. ‘I didn’t know the Frankenstein monster was non-fiction! Hi there mate! How is he in real life?’ Dirk was waving at him like an enthusiastic school girl which caught his attention. ‘Oh, he’s coming this way!’ He walked towards us, menacingly and faster than you would expect from a monster like that. ‘I think we should get inside…’ I tried to pull Dirk with me, but he wouldn’t listen. ‘He seems pretty nice.’ But right at that moment a reporter walked by, trying to ask him a question. 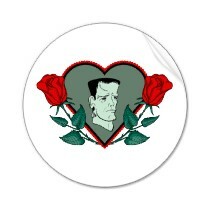 The Frankenstein monster looked at him, a bit bedazzled, but then grabbed his head and turned it around. We heard something break, probably the guy’s neck, and he fell to the ground. We ran to the front door, trying to open it. We had shut ourselves out by barricading the doors. In the back we heard the Frankenstein monster scream. ‘We need to get out of here, now! No way I’m becoming his lover. Let’s try the back door.’ I ran ahead of the group, dodging a good amount of fictional and real people. Some I recognized, Dorian Gray was talking up a young non-fiction boy, but as soon as he saw me he started screaming about the devil again. There were people on broomsticks swooshing by, playing Quidditch and for a second I thought of Cedric. ‘Polly, we need to keep on running!’ This time it was Dirk who grabbed my arm and dragged me with him. We finally reached a back door, but it was also shut. A trail of scary and weird fiction was following us. Some slowly, some fast, but all threatening. Poe smashed in the window, opened the door and let us in. Together we pushed a closet in front on the door, so they couldn’t come in after us. With our backs against the closet to keep it in place, we felt them push the door. It felt like forever, but they finally gave up and walked away. Probably distracted by a non-fictioner, trying to get away from this pandemonium.